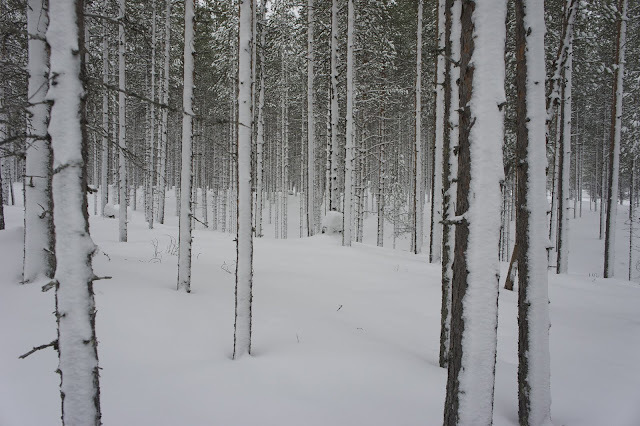 And on to my second week of internship at Upitrek, the Winter Fun in Finland Tour. The idea of this trip was to give the clients an introduction to different winter activities, and hence tour is ideal for families with children and people who're not settled on one thing yet and like to try different ways to enjoy the snow and cold. It started on Sunday night as I met my fellow guide Tumppi and our seven clients from the Netherlands in a restaurant in Kuusamo. After a good dinner of typical Finnish cuisine we retired to the hotel in the centre, as the next day we would go direction Ruka for some Husky sleigh ride. This was the first time ever I went on a Husky trip, and it was quite enjoyable, even if it was short. I am a dog person, so this was quite exciting and I enjoyed the time with the dogs a lot. I can imagine to do a longer organized trip, of a few nights, with Huskies in the future - it must be quite something to travel with these great creatures through the white fjells and forests of Lapland. After coffee, sausages and pulla (a Finnish pastry) we continued to Hossan Lomakeskus, our basecamp for the week. Following lunch we gave out snowshoes and some instructions, before some of our eager clients went for a walk to get familiar with snowshoes. Setting off over the lake. 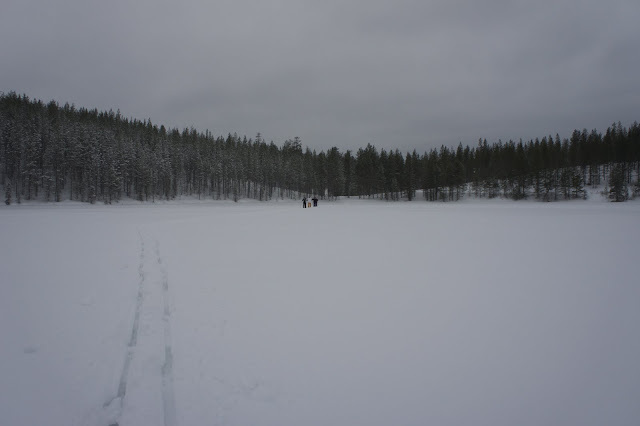 Tuesday morning I set off with the clients towards Hossan Luontokeskus (Hossa Nature Centre), where we would have a look at the Museum and enjoy lunch. 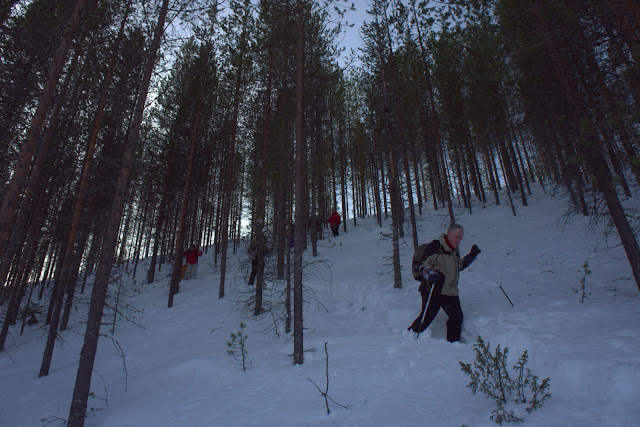 It was good fun to go with the clients, after we climbed up the ridge via the skiing and snowmobile track we went along on top of the ridge, until we went in a zick-zack method the good 40 m in elevation down. For people who stood the first time on snowshoes this was a challenge, though everyone made it safe and sound down to the lake. And to top things off, we saw a few female Black Grouse taking off while going down! We were faster than I thought so I did a few pranks (walking in circles, zick zack, getting lost =) before we climbed the small hill to the Nature Centre. Lunch time. The weather was very much on our side - which is always nice - so we set off towards the cabin at which we would spent the night. Now going through the National Park area we followed the summer trail markings, this was easier than going off-track - the sun meant that the snow was melting and becoming a mush which made it more difficult to walk on top of it - unless you're Legolas (See the Everytrail Trip of this day)! 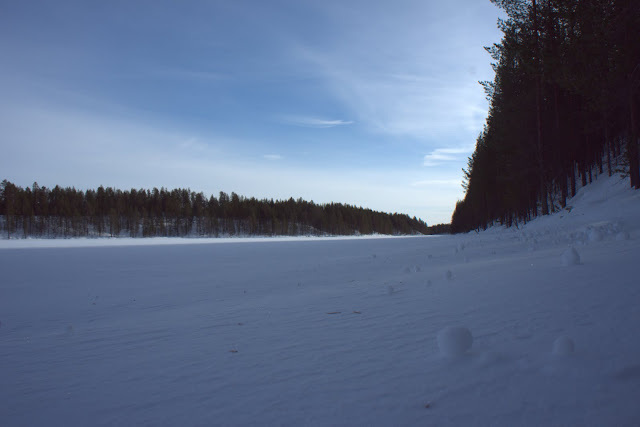 As we arrived early yet again, and there was plenty of daylight still, one of the clients and me went for a fine walk through the forest and back over the lake. We witnessed two Raven - in many parts of Europe very rare, here more common than crows at this time of the year - fly into the dusk, which was very beautiful - the photo doesn't do it justice. 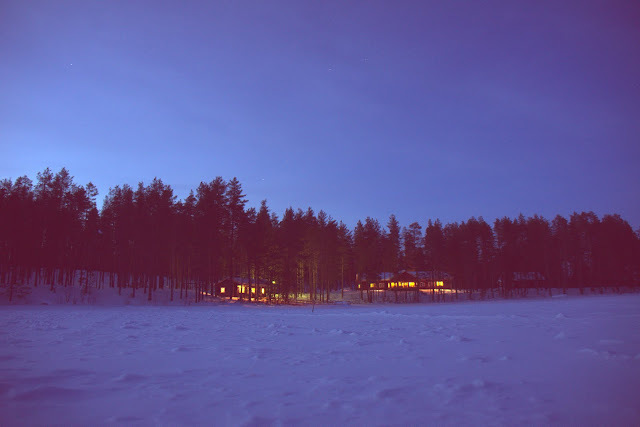 The warm glow of light from the sauna and cabin. 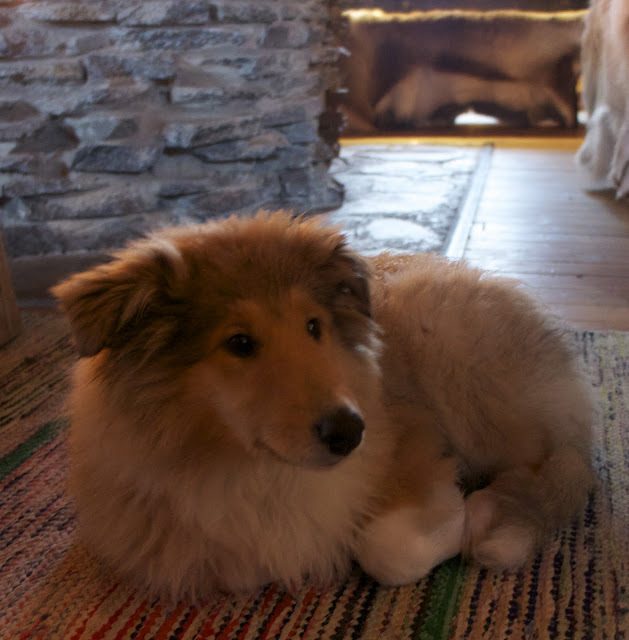 Wednesday we snowshoed back to the Hotel in Hossa, with a lunch stop at a cabin. 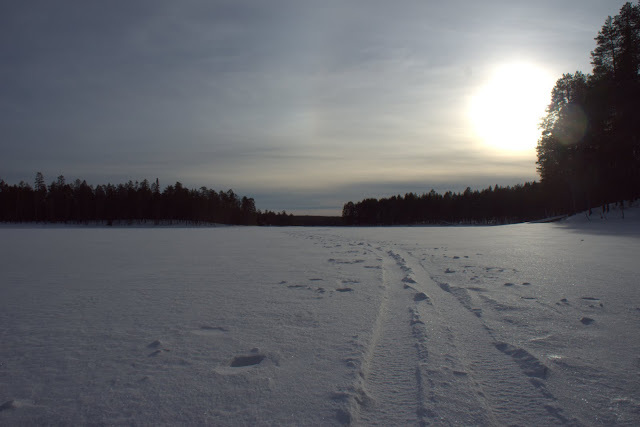 Groups separated, and while the Gentlemen and me made in a straight line through the forest the Ladies and Tumppi followed the skiing track to the cabin. The wind was blowing pretty hard over the ice, but it makes for a beautiful sight seeing the loose snow speed over the ice crust, swirling up in a little vortex. At the cabin I showed the clients how to start a fire just with birch bark, a fire steel and a puukko which resulted in some "Ahs!" and "Ohs!" and soon sausages were being grilled and the water for the coffee started boiling. We continued on a easy route towards the hotel, though again we were so fast (Dutch people are the tallest people in Europe and hence have super-long legs =) that we made a little extra round over the lake, taking photos, making snow angles, and enjoying the winter sun (See the Everytrail Trip of this day). 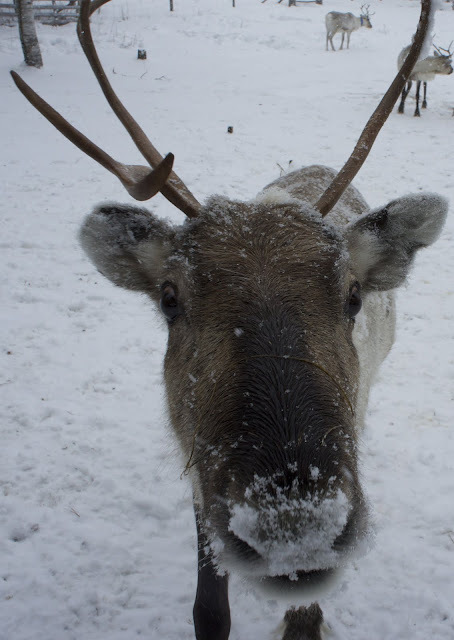 Thursday was fairly relaxed, with a visit to the Hossa Reindeer Farm. Lovely creatures, and so tasty. After spending some time in the enclosure with them, feeding and petting them, the clients went for a short sleigh ride á la Santa before getting into the beautifully renovated house to warm themselves next to the fire and enjoy a good reindeer soup. A video about reindeer farming and history later we continued back to the hotel. I was a bit bored at the hotel, so I went for an extra skiing round. Friday was our skiing day. I am now totally hooked on skiing and looked very much forward to this day, so right after breakfast we started with some basic instructions - how to fall right, get up again, how to get forward, get up and down a hill, and break. A few rounds on the beginner circle before we moved to the advanced circle and hill, where I went with some of the clients for a small tour already - they stood the first time on langlauf (Cross Country) skis and did really well, very excellent! It had snowed a lot that night and morning. After lunch I went with a small group for an afternoon trip to the Hossa Nature Centre (Everytrail Trip), which was very nice again. To see beginners so eager to go for a trip is very rewarding, and while there were some falls everyone arrived in one piece back at the hotel in the afternoon while feeling that they accomplished something great - I was pretty proud of them! 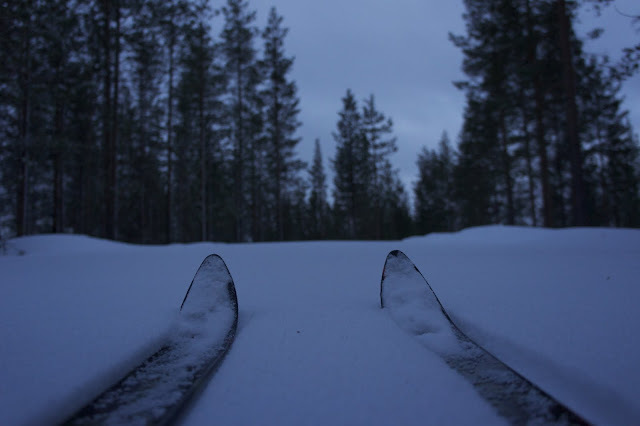 Off track with langlauf skis. Where there's a guide, there's a way. Saturday was our last day, and clients could choose an activity they'd like to try more or go for something new. 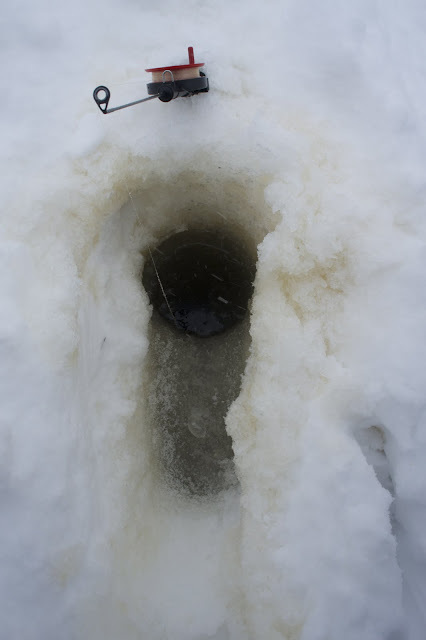 So the morning was spent with ice fishing, while some went snowshoeing as well. I spent time packing and reading, as also I would travel back home on the following day. Sitting around the dinner table the question for northern lights came up. 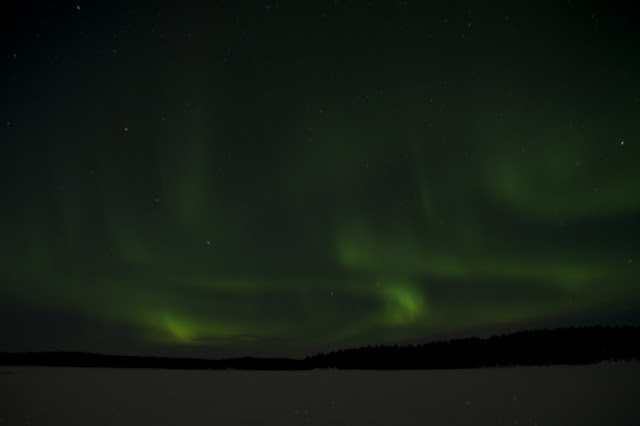 While we saw some very weak ones on Monday night, our clients felt that they'd like to see "proper" northern lights on their last evening. 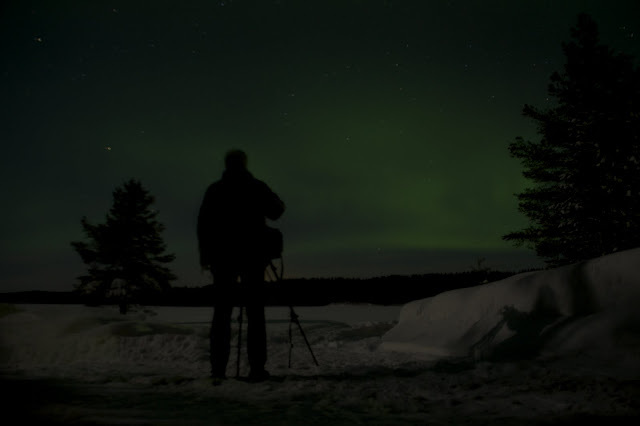 While there is no switch to put Aurora Borealis on, a sacrifice to the pagan gods can help make them appear =) I put on my jacket to see if there's a show on, and much to the joy of our guests, there was. 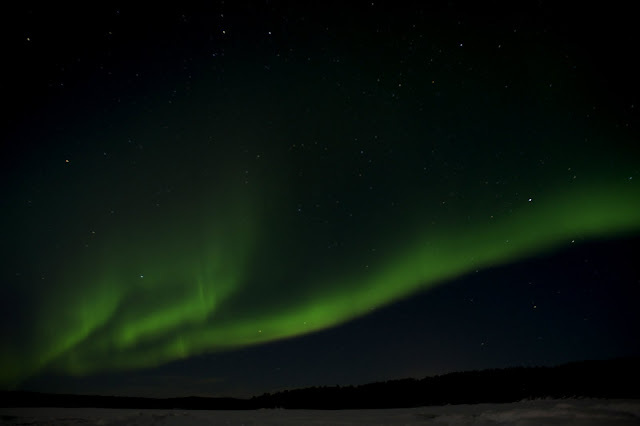 It was spectacular, with even red and yellow northern lights to be seen besides the green ones. Fantastic! And so the week ended with a great show. Sunday morning a last breakfast together, collecting the gear the clients loaned, packing and jumping on the taxi bus to Kuusamo. I myself jumped on the bus and started my 10+ hour trip back south, planning routes for upcoming trips, reading, tweeting and looking forward to sleep to my loved one in our own bed. A guest enjoying the show.